For over a century, interest and fascination in the events surrounding the infamous sinking of the Titanic have been inexhaustible. Who wouldn’t be curious about the massive, luxury ocean liner which landed at the bottom of the Atlantic after colliding with an iceberg? That which led to the untimely deaths of over 1,500 innocent people. But beyond that, countless themes abound both about what led up to and what happened during the disaster. Did it demonstrate for us the limitations of technology or the unparalleled power of nature? Did it illuminate man’s very human frailties including his inadequacies, overconfidence, and oversight? 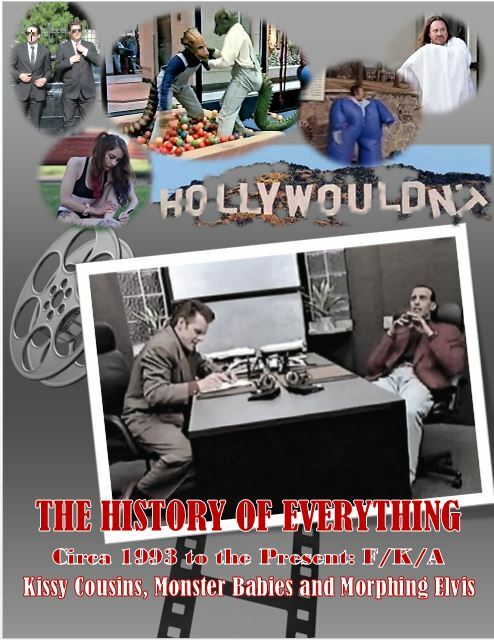 Did it bring to light the hollow notions of social class and privilege, entitlement and greed, juxtaposed against the noble virtues of courage, compromise, altruism, and the preciousness of all life – as well as countless other aspects (both negative and positive) of human nature? The answer is yes. Yes to all of this and more. 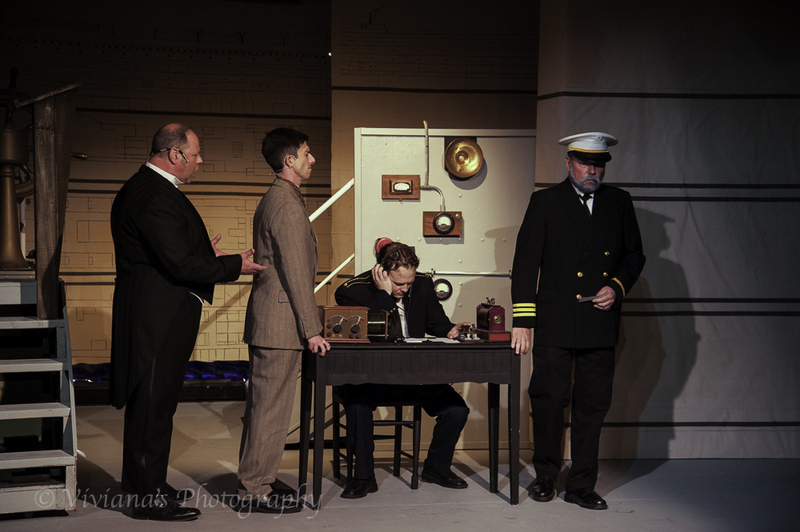 Now on to matters of this century – namely, The Opera House Players’ grand production of Titanic: The Musical, directed by theatre vet Sharon FitzHenry, with book by Peter Stone and music & lyrics by Maury Yeston. 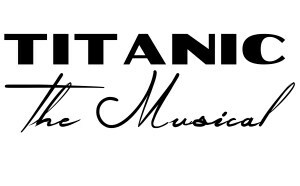 Titanic is the five-time Tony Award winning musical which debuted on Broadway in 1997 to great acclaim. The word “titanic” is derived from Greek mythology and means, not surprisingly, gigantic. I therefore could use many predictably unoriginal and altogether overused adjectives here; words such as colossal, mammoth, or immense to describe the theatrical undertaking, but I won’t (or did I already do so? wink, wink!). 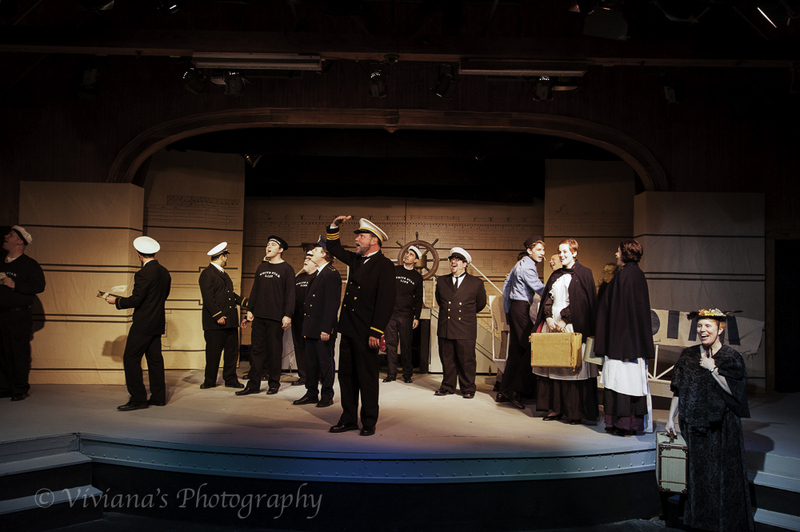 Instead I will say that work of The Players at Broad Brook Opera House, unlike that of those on the actual maiden voyage of the White Star Line’s RMS Titanic, resulted in a great success. 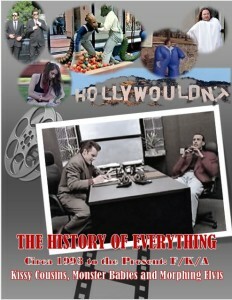 With a large cast featuring 21+ actors playing over 50 roles, the production was quite an impressive feat. Ordinarily in a theatre review, I’ll illustrate only select elements of the initial plot structure to entice and titillate readers – and as a firm disbeliever in spoilers, I’ll only take it so far. But as in the classic five-act dramatic pattern, the events of the sinking of the Titanic need little introduction and therefore there’s nothing I really can disclose that isn’t already known. However, the way in which it all has been woven into this compelling and emotional musical journey, it will draw you in and have you holding your breath; and all the while you’ll be wishing the story will have an entirely different ending. Few don’t know the exposition: we first are told of the incredible feat of engineering of the luxury liner, with her opulence and richness in excess; and about it we hear “How Did They Build Titanic?” and “There She Is” sung by many in the company. It also speaks to the dreams of its passengers: her Third Class or steerage passengers (those emigrating to America for a better life) and Second Class (those who wish to emulate the wealthy) sing “I Must Get on that Ship.” About the First Class passengers (the wealthy), a starry-eyed patron of Second Class, Alice, sings of the “First Class Roster,” which included none other than Isador and Ida Straus of Macy’s department store, and mining tycoon Benjamin Guggenheim. In the rising action, the “unsinkable” Titanic is pushed past her limits of speed and warnings of an iceberg ahead are ignored – mainly because an overzealous chairman and owner of the White Star Line, J. Bruce Ismay, was more concerned about her reputation and getting to New York on time. We also well know the climax. As the company sings “Finale Act One,” the Titanic tragically strikes the looming ‘berg. In the ensuing falling action, frantic passengers (mainly First and Second Class) scurry to the upper decks hoping to board one the sadly insufficient supply of lifeboats “To the Lifeboats.” Ultimately, in the denouement, innumerable lives are lost and the Titanic’s survivors are devastated. 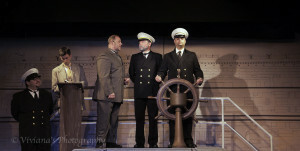 Should the tale of Titanic: The Musical have been all tragedy, it likely would be impossibly hard to sit through. Instead, as in life, there are comical, tender, and happy moments. There also are many threads of hope and stories of survival. Life did go on for many and lessons ultimately were learned. And it is through FitzHenry’s skilled direction that the ginormous cast moves about the modest stage with ease and authenticity, bringing each individual character to life. Thank you to the Opera House Players for tackling this behemoth and for doing so with the style and elegance this significant piece of history deserves. 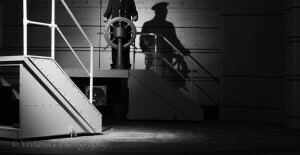 I think it is only fair to disclose right up front that I am a Titanic buff. I became one after seeing the 1958 film A Night to Remember on television in the 60s. As a kid, I went overboard (pun intended) and gobbled up any information related to the Titanic. 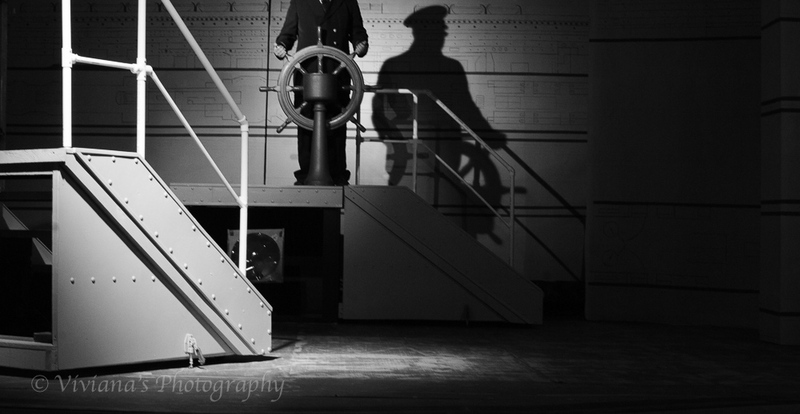 So no matter how good or bad Broad Brook’s production of the musical version of Titanic, I was going to be biased. 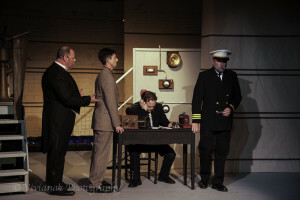 I will say as objectively as I can, and after 30 years in the theater and film business, Broad Brook’s production of Titanic: The Musical is – in a word – terrific. The obvious “immensity” of the show made it prohibitive for national touring, regional, and community productions from both a financial and technical standpoint. Fortunately, Don Stephenson, one of the original Broadway cast members developed a “Chamber” or “Ensemble” version that was more amenable to smaller theatre houses. The Ensemble version reduced the cast, set, and music elements, but did not reduce the overall drama and/or intensity of the disaster. The Ensemble version reduced the cast to twenty actors who nevertheless had to double and play fifty-plus parts, including characters from all three classes: first, second and steerage or third. I was counting down the days to Broad Brook’s opening, especially since the anniversary of the Titanic, April 15, 1912, has just passed. But I asked myself, even with the reduced cast and band members, how could Broad Brook pull it off knowing the spatial limitations of the theatre? I am pleased to say that Broad Brook successfully did what history could not: it kept the Titanic afloat. The Opera House did it with the same skills they invest in all of their production: ingenuity, hard work, great casting and direction, and a love and devotion to the craft of theatre. The acting was top-notch, not a weak link in the talented Ensemble. The cast is far too large to dive into each actor’s strengths as I usually do. Suffice it to say, the entire cast worked together as one, each a team member and each in sync with their fellow actor. I was not only amazed as the actors quickly morphed from one character to another, but also how quickly they changed costumes and, in some cases, hairpieces. I would be remiss if I did not mention that everything was not completely smooth sailing. There were some opening night microphone/audio glitches and some of the scene changes seemed a bit awkward (although they were moving the largest movable object on Earth). 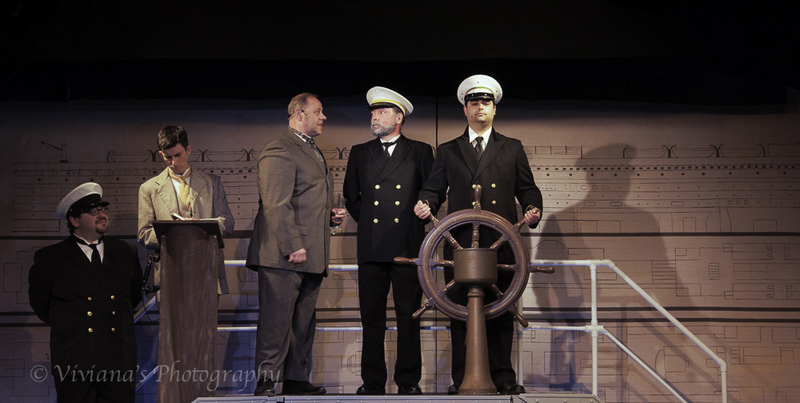 But, overall, the behemoth of a production worked exceedingly well – much better than the Titanic itself. 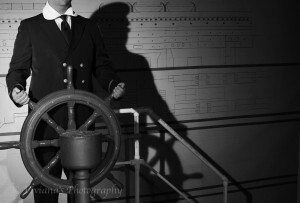 I must note, having worked on Titanic projects that the casting of one role is particularly key – and that is Captain E.J. Smith. In many ways, the Captain represents the ship itself – a man larger than life; one who seems impervious to human frailty. In James Cameron’s version, distinguished actor (who also worked on one my projects) Bernard Hill played him. In A Night to Remember it was famed, British character actor (who had an extensive seafaring background as well) Laurence Naismith. And in the 1996 television mini-series, Titanic, the late, great George C. Scott played him. The casting of Dennis J. Scott in the role of the Captain was an excellent decision. Mr. Scott had a commanding presence on stage that fit nicely within the tradition of his predecessors. While I’ve seen Danny Viets in other shows at Broad Brook, watching him play Henry Etches in this one reminded me of a young Roddy McDowell – especially when he played a yacht servant in the comedy Overboard. I feel compelled to bring this up since I mentioned this odd thing to Mr. Viets on the way out of the theatre without any further explanation and I wanted him to have an “aha” moment. 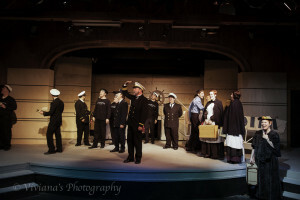 The success of Broad Brook’s Titanic was definitely buoyed by the able-bodied musical direction by Bill Martin and Artistic Direction by Sharon FitzHenry. They both did yeoman’s work in keeping this mammoth production on course! The Ensemble version works in a theatre like Broad Brook because as Ms. FitzHenry says, it “turns the focus back to the men and women of that fateful night.” I had chills when Isidor Straus (Glenn Gordon) and Ida Straus (Jayne Newirth), the owners of Macy’s who decided to die together on the Titanic, renewed their marriage vows. The Titanic has a special place in history and in our collective consciousness, not because of the severity of the disaster (although it was great) but rather the magnanimity of humankind’s best qualities that were exhibited by people who knew they were about to die: courage, generosity, sacrifice, hope, and, most of all, love. 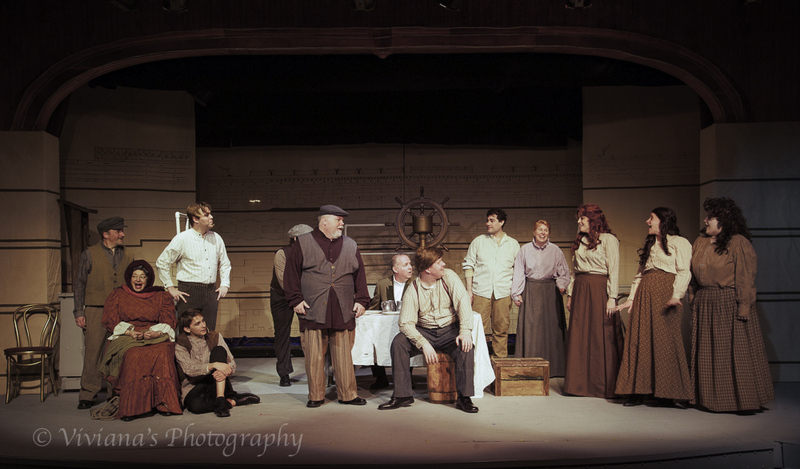 Even though Broad Brook’s Titanic will definitely not sink and there will be clear sailing for it for the rest of its run, I recommend catching this authentic human interest tale told by a seaworthy cast and crew. So run down to the gangplank and get a ticket before it leaves. * Of my projects, the first was a restoration of the first full-length sound film done on the Titanic in 1929 called Disaster in the Atlantic. 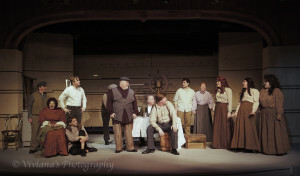 The other two, a cinematic and audiobook version, were based on the 1912 Senate Hearings into the disaster and featured an international cast of actors from former Titanic projects. David McCallum, from A Night to Remember, hosted all three. Even though John Cunningham and David Garrison from the original Broadway cast were in my productions, as I said, regrettably I never got to see it on Broadway. By the way, all three of my works are available on my Wayne’s You Tube channel – sorry for the shameless plug.